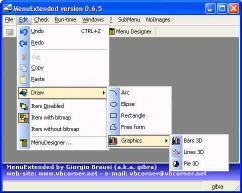 MenuExtended is a ActiveX DLL component for VB 6.0 that allow you to subclass VB menu on your programs/projects written on VB 6.0.
add image and description to each menu item. FT DVD Author - convert and burn AVI WMV DivX MPEG XviD RM RMVB ASF files to DVD with DVD menu creator to create DVD menu. Hot!